This luxurious villa is located in the most exclusive area of Puerto Vallarta just eight minutes South of downtown and approx. 25/30 minutes from the airport. The South Side of Puerto Vallarta, where the Mountain meets the Ocean, has been recognized internationally as the 'Golden Zone of Puerto Vallarta.' This area is also known as the 'Mexican Riviera'. 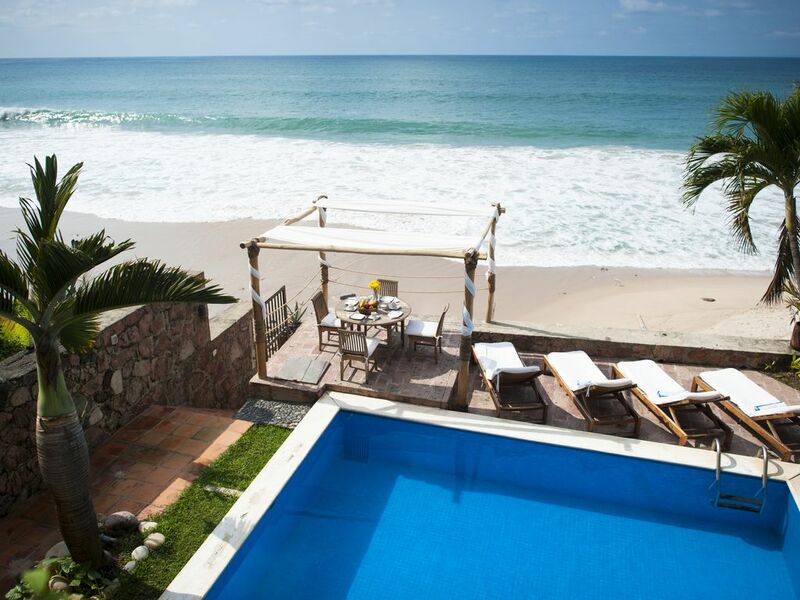 This is one of the few houses in Puerto Vallarta that´s REALLY ON THE BEACH... experience the comfort of taking a few steps down off of your pool into the sands of Playa Punta Negra... one of the best sands of Puerto Vallarta. Experience morning and night walks through our beautiful family friendly beach. Enjoy our cook serving you 3 meals a day... our housekeeper pampering you with drinks and our housecleaner taking care that the villa is spotless for you... staff service included in the price. Our villa has 6 bedrooms all with A/C, ceiling fans and complete bathroom. Each bedroom has 1 King Size bed and one of the bedrooms aside from the king size bed also has 1 double bed. We provide wifi, satellite TV, flat screens, speakers and sound system in the pool level, we help you coordinating transit and boats/fishing/scuba diving in Los Arcos landmark, zip line activities. In the lower level we have a big outdoor patio with huge lounge space, al-fresco dining and bar facilities. Stay in one of the best houses in Puerto Vallarta... relax in our jacuzzi while reading a book... hearing the relaxing sound of the Ocean... with all day service waiting anxiously to pamper you! This home has been in my family since the moment of it´s construction. We have been members of VRBO since the year 2000 and we are very proud to grow hand by hand with this amazing website. I love to travel the world, scuba diving, golf, tennis and try to offer our guests the same experience that I look for when I travel. This property is very important for my family because it has a lot of sentimental history for us. My father arrived to Puerto Vallarta when it was first being developed and chose this special spot in Playa Punta Negra. In that time there where a lot of places available however he didn´t hesitate in choosing this location due to it´s privileged beach and setting. He decided to build this villa as a family vacation home in the place he considered would be one of the best beaches of Puerto Vallarta and time proved he was correct. When my father constructed this villa, his idea was to build a home that blended with the beauty of the constructions that made the 'Puerto Vallarta Style' a architectural concept. For this reason he incorporated two domes, roof tiles, rocks, marble and a white color through out the villa. All of this combined with all the necessary amenities in order to enjoy the villa with a great comfort. We consider our staff members friends of our family because we've known them for a long time and they're one of the strengths of our villa. We are convinced that very few homes in Puerto Vallarta can offer the service that we offer to our guests and the great location of our villa being one of the few in Puerto Vallarta, REALLY LOCATED ON THE BEACH. We have two living rooms, one in the upper level and a very big one located by the pool in the beach level, perfect to hang out all day long. We have two dining areas. One is located in the upper level and the other one is located in the beach level. Both have ocean view. Satellite TV with many american channels. Bose Speakers in the pool level. We can gladly contact a boat owner that will give you a good rate if you want to go fishing, snorkelling or visit beaches you can only arrive by boat. He picks you up and returns you to our beach. Our Pool is totally private for your party to enjoy. It can be heated in the winter .